This is one of the best pizzas I’ve made in a long time, if I do say so myself! The base is “I Can’t Believe it’s Not Cheese” sauce from The Ultimate Uncheese Cookbook. I know I use this constantly; I’m just so impressed with its richness. 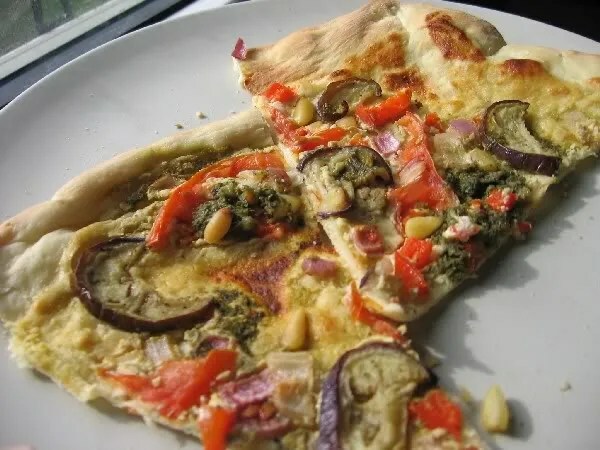 Unlike “cheese” sauces whose main base ingredient is nutritional yeast, tahini and miso predominate here, creating more of an earthy, blue cheese kind of bite. 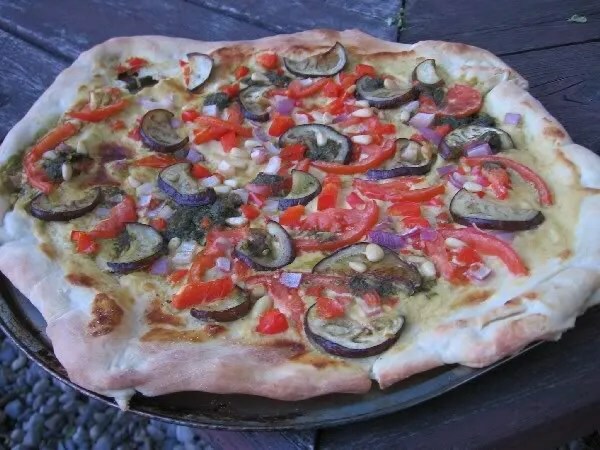 So, I spread some cheese sauce over the pizza dough, and topped it with eggplant slices I had roasted, toasted pine nuts, sliced tomatoes, red onion, red pepper, and a basil-garlic-lemon-juice puree (this puree’s sharpness balances the rich cheese quite nicely!) Up close below. I could eat Pizza for breakfast, lunch and dinner! This looks mighty fine and I’m chuffed you typed up the recipe for that cheese Sauce ‘cos I’ve been eyeing that book for THE LONGEST TIME but it’s too pricey for my wee budget. So thank you. You’re welcome!! I figured I post so often about making stuff from that book that it was high time I include at least one recipe!